The original. These days we’re used to seeing bigpower super-estates, but back in the early ’90s, the RS2 was a revelation – and it can still hold its own today. Here’s why it’s so special…Words Jamie Arkle. Photography Davy Lewis. 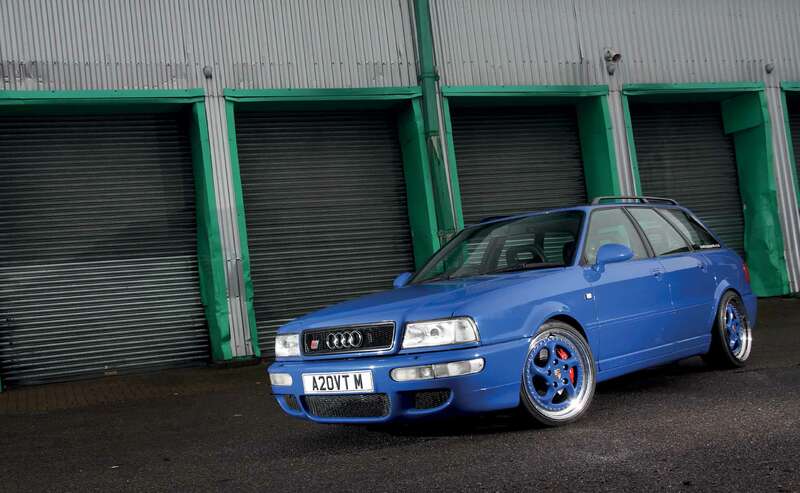 It’s no exaggeration to say that the Audi RS2 has passed into motoring folklore, and it’s now part of the Audi legend itself; the direct ancestor to each and every big-power, lunatic creation to have emerged from Audi ever since. Most of you will be aware of the basic story behind the car, Porsche’s involvement and the fact that, at launch, it was comfortably the fastest estate car in the world, an accolade it held for many years. It was also quicker than the mighty McLaren F1 from 0-30mph, and it could show a clean pair of heels to any supercar you’d care to mention in the wet. All of this leaves us with something of a dilemma; is it right to actually tune and modify the RS2, especially now that they command a hefty price tag and are bone fide modern classics? The debate will almost certainly rage and rage, but the RS2 you see before you might well help you make up your mind. It’s been built by Quattro Coachworks, a firm who know near enough everything there is to know about Ingolstadt’s finest, with a truly jaw-dropping CV of previous projects. The car’s owner first brought it to them four years ago with a recently blown engine – a failure that’d happened mere months after he’d parted with cold, hard cash for it! “He initially only brought it in for an engine rebuild, but he saw the work we did and how much we could potentially do with the car... that’s what really set the whole project in motion,” recalls the owner of Quattro Coachworks, Ish. This was never intended to be a ruthless hunt for massive power figures though, and the owner was clear from the start that he wanted a modernised RS2 – a car with slightly more power than standard, but with all its original character left intact. It’s comparatively easy to wring big numbers from the RS2’s five-pot turbo, but preserving what made it so special in the first place? Well, that’s deceptively challenging. The first order of business was to sort out that 2.2 slung over the front axle, adding a few performance tweaks along the way. The bottom end was rebuilt with standard pistons, rods and crank, while the head was carefully checked over and bolted back into place. So far, so stock, but the guys also fabricated a custom downpipe and a suitably aggressive sounding exhaust system. A K&N induction kit found itself thrown into the mix, while the management was brought up to Stage 2 specification, good for a very healthy (not to mention usable) 390bhp. The theme of ‘if it isn’t broke, why fix it?’ continues to the transmission, where you’ll find everything exactly as Audi intended. 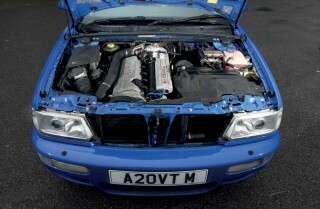 “All we did was give the six-speed gearbox and the differentials a careful strip down and rebuild, then painted the casings,” muses Ish Don’t go thinking that this was simply a case of a rebuild though, as Quattro Coachwork’s really did go to town on the chassis and the bodywork. The RS4 was bare-shelled and all its suspension, brake and transmission components sent off to be powder-coated, then given a lick of paint. The shell was also taken back to bare metal, the front wings and boot lid were replaced with factory items in better condition, then everything was given a brand new coat of Audi Nogaro Blue. Of course there was never any consideration given to replacing this, as, after all, it’s one of the most iconic colours ever to grace an Audi! This done, it was time to start re-constructing the RS puzzle, Ish adding polybushes to the freshly powder-coated suspension parts, along with box-fresh bearings, some H&R coilovers at all four corners, and some custom braided brake lines from SFS. The RS2’s factory stoppers always were awesome bits of kit, with four-pot Porsche calipers and, on this particular car, a set of vented discs and aftermarket pads. Not rocket scientist stuff, but then that’s hardly the point – everything done to this car has been carefully considered so as not to detract from its original character. 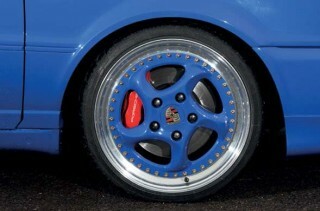 “The cars were fitted with Porsche brakes, so it’s not like the standard RS2 was short of stopping capability, but with the extra power going through the drive-train we wanted to give it an overhaul and a mild tweak, just to make sure,” muses Ish Finally it was time to bolt on the wheels, beautiful Porsche ‘twist’ split rims, 9x18in at the front, 9.5 at the rear. RS2 cognescenti will already be well aware that the car was originally sold with Porsche Clubsport alloys, so although the ‘splits’ were a deviation from factory spec, they were at least in keeping with the theme of the car. The car that rolled out of Quattro Coachwork’s doors mere months later didn’t look massively different from the one that rolled in, but, as is the case with some of the most impressive builds, the looks only tell a fraction of the story. This RS2 is without doubt one of the finest in the country, capable of bloodying the nose of near enough any modern sports car you care to mention, and leave them for dead when the weather takes a turn for the worse. Perhaps the best thing about this particular car though, is that it’s used on a near daily basis, with its owner often opting to commute in it in the dead of winter. That’s heartening as there are far too many RS2s that spend their lives moth balled, bought as future investments with no passion behind the purchase, nothing more than glorified savings accounts. This car is about as far from that mindset as it’s possible to be, and it’s all the better for it! Top: This RS2 goes as well as it looks. Perhaps the coolest thing about the RS2 is the fact that it was the product of a disagreement. Audi and Porsche were both under the VAG umbrella and agreed to share knowledge and parts to create Audi’s ’90s uber-car, but the latter was adamant that the resulting car could never be sold in coupe guise, out of fear that it would steal sales from its own range. That didn’t prevent Porsche working its engineering magic on the cars though, and the Audi 80 shells were actually assembled as RS2s in Stuttgart, not Ingolstadt. It was there that the 315bhp, 2.2 five-cylinder turbo was crammed between the wings, the six-speed gearbox was craned into place and the Porsche Clubsport alloys were bolted on – the only obvious external cue as to Porsche’s involvement, unless you were very keen eyed and spotted the Porsche Cup mirrors! The car might now be a legend, but you’d have had to have been brave (and rich) to have bought one new, with the £45,705 asking price putting all but the most passionate of Audi enthusiasts off. 2891 RS2s were built in 1994-95, with just 180 RHD cars coming to the UK.